Can’t travel around the world this fall? You can with this bangle style bracelet as part of your wardrobe! Included are a rare 18th century glass bead from Afghanistan (the gray green focal), verdigris ceramic beads from Greece, an amber bead with brass coiled wire caps from Tibet, recycled glass beads from Indonesia and carved bone beads from Africa with vintage beads and a brand new lampwork bead from the USA! 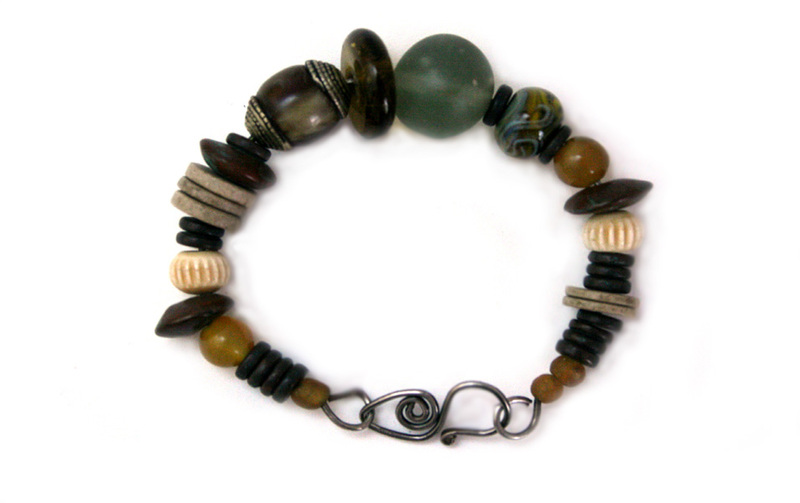 The sterling silver wire and clasp have been given a coppery glow to complement the beads. Fits 6 – 7 inch wrist.